The advanced technology of Hansgrohe's Raindance S150 AIR Green jet showerhead enhances the bathing experience by making water droplets feel larger while reducing water consumption at the same time. 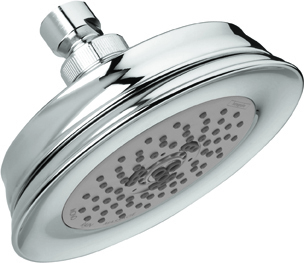 The showerhead costs $140. By and large, bathroom renovations give me jitters. Choosing Hansgrohe for plumbing fixtures made the process less intimidating. The Hansgrohe team designs products that seem like incarnations of The Happy Home Workshop’s tagline—they’re stylish, sustainable, spirited and full of substance! 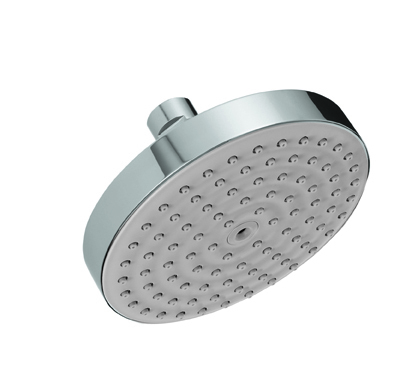 Their newest showerheads, the long-awaited additions to the well-regarded Raindance and Croma series, provide the full and abundant coverage one expects from high-end products, but they also offer significant water savings, which I’d definitely call the best of both worlds. I’d even go so far as to say that enhancing the everyday bathing experience seems to be Hansgrohe’s specialty! The brand new Raindance AIR Green and Croma Green showerheads employ Hansgrohe’s patented EcoAIR injection technology, which draws air into the spray face and infuses the water with air to create larger water droplets that give you the sensation that you’re being covered with more water than is actually being used. All of this is done at a low-flow rate that translates into water-savings of 20 percent. In addition, all Raindance and Croma no-clog spray channels include a QuickClean function that resists limescale buildup and allows for any deposits to be easily wiped away, leading to a healthier, more sustainable home. Available in chrome and brushed nickel, the designs range from classic and traditional to sleek and contemporary. There the similarities end, as each line includes its own signature features, but all are guaranteed to offer a most luxurious bathing experience in a cost-efficient eco-friendly way. Hansgrohe's Croma C100 Green jet showerhead saves water usage by 20 percent. The showerhead costs $70.